The collection this year is quite a vibrant one but has been cleverly mixed with some more relaxing colour that give designers and stylists a great range of colours to choose from. y contrast, Primrose Yellow sparkles with heat and vitality. Inviting us into its instant warmth, this joyful yellow shade takes us to a destination marked by enthusiasm, good cheer and sunny days. ontinuing the tranquil mood, Pale Dogwood is a quiet and peaceful pink shade that engenders an aura of innocence and purity. The unobtrusive Pale Dogwood is a subtle pink whose soft touch infuses a healthy glow. My Job is to assure my brides are suggesting tasteful and timeless colour palettes from the get go. When it comes to colour there are the classics and there are the trends. Possibilities can be endless and overwhelming… its all about finding the right balance and what is appropriate for your big day. Take a look at your reception space. For instance, if you’ve chosen a reception area with burgundy and gold carpets, a color scheme of lime green and fuchsia will surely clash, and there’s really no way around it. Tip - Use the venue’s decor to help guide your color palette choices. Or, you could simply choose a space that lacks a lot of color so that you don't have to worry about a potential clash. Make sure your stationer offers you printed proofs prior to getting all of your invitations printed. Colours you see on your computer screen are often very different then what your final invitation are set to look like printed. Tip - If you stationer does not offer printed proofs make sure you ask them and pay offer to pay that extra fee. This could save you time and money in the end. In my opinion, selecting your wedding colours is one of the most important element of wedding planning as they set the tone for your big day. However, if you don't decide in a timely manner, be prepared to potentially find yourself scurrying around in a desperate attempt to find items that will match or coordinate. This can be especially true if you've chosen a more unique color palette. Tip - Give yourself a deadline! Maybe check out Pinterest or Google Images for inspiration. Contrast is important to many aspects of your wedding day. If you have too much of the same colour you may end up with a flat uninteresting look and feel. Go for a more subtle contrast or perhaps bolder look depending on your personality and wedding style. Tip - Keep contrast in mind when selecting your attire, invitations, table linens and more. Think about the big picture and note that each of these layers should not all be the Same. Exact. Color. A few varying shades will go a long way! Sadly, this happens a lot! 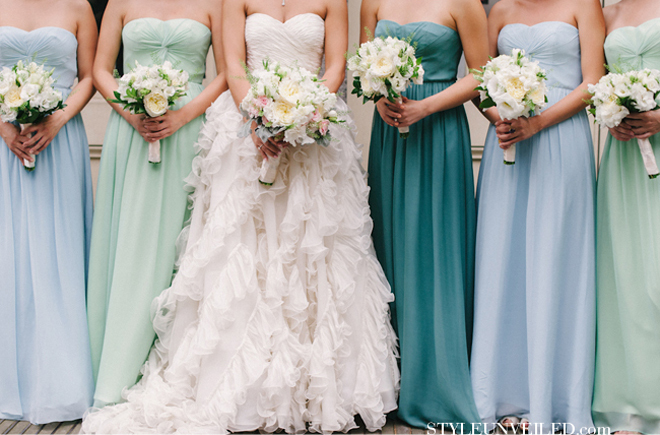 The truth is that not every color is a great pick when it comes to dressing your bridal party. Some hues wash some people out while others simply aren't flattering on anyone. Tip - When selecting a bridesmaid dress, consider the varying skin tones and body shapes of your favorite ladies. For instance, not everyone is going to be able to rock a cocktail-length dress in chartreuse. Take your girls to the bridal shop and narrow down a color that complements the majority of your attendants.